What activities do Home Caregivers assist individuals with? 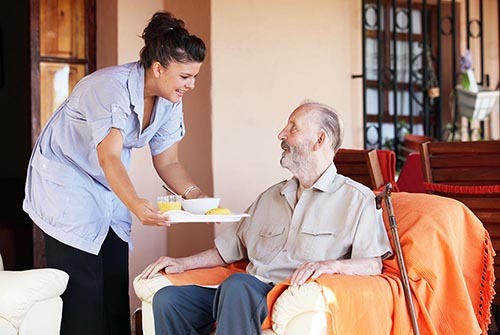 Home care services provide varied services in the home for people who are unable to provide such services for themselves or would rather have someone else do it for them. Personal Care, bathing, grooming, dressing, toileting, etc. Reminding and assisting your loved ones to take their medications. Transporting individuals to events, errands, and shopping. Assist with housekeeping, laundry and changing linens. If your loved one or family member is in need of Home Care, learn more about how this service can benefit their life. Many elderly and disabled individuals enjoy living in the comfort and safety of their own home, and our services are designed to prevent premature placement in an institutional setting. Home is where everyone wants to be! Our home care assistants provide patients of all ages with assistance to perform the most basic tasks of daily living in a conscientious, competent, client-centered approach, improving quality of life and promoting independence. What is the Difference between Home Health and Home Care? Home Health is a "skilled need service" and requires a doctor's order while Home Care is a "custodial services" and does not require a doctor's orders. Anyone can receive assistance in their home through a Home Care agency. Medicare covers skilled nursing at home but does not cover custodial care. Contact the Idaho Department of Health and Welfare, CSI Office on Aging to see if you qualify for any of the programs offered. Who provides the services and how do I access them? Our Home Care staff is carefully selected and screened for your protection and peace of mind. We are bonded, insured and meet or exceeded all federal and state guidelines for a Home Care Agency, providing personalized training and operating as a drug free workplace. We provide our private fee service at an hourly rate. Contact us at (208) 732-8100 for more information regarding our fees for service and availability. The College of Southern Idaho Office on Aging offers assistance through the Homemaker and Respite programs. They can be reached Monday through Friday, (208) 736-2122 or 1-800-574-8656 for more information regarding eligibility. We provide services through the Department of Veterans Affairs. Contact your local Department of Veterans Affairs office for more information for services and eligibility. We provide services through the Department of Health and Welfare Medicaid. They can be reached Monday through Friday, (208) 736-3024 or 1-800-826-1206 for more information regarding eligibility. Local social services districts usually contract with home-care agencies that employ aides to provide Medicaid funded personal care services. Contact your local Health and Welfare department for information regarding an assessment and eligibility. A nurse caseworker uses the results of the assessments to recommend the appropriate level of care, frequency and duration of services. The need for services is reassessed annually. Services provided by a caregiver to assist you with your personal care needs such as dressing, bathing, toileting, mobility, and grooming. Services provided by a caregiver to assist you with necessary housekeeping duties including meal preparation, linen change, laundry, vacuuming, dusting, mop/sweep, cleaning the bathroom and kitchen. Assistance to help you with non-medical transportation needs such as grocery shopping and errands. Services provided by an aide to give the primary caregiver in the home a break with companionship, supervision, and assistance with such tasks as bathing, dressing and other care needs. Services provided by a caregiver for companionship and safety in the home.